And here we are, having completed the first 9 Principles of Joint Operations (HERE, HERE, and HERE). Today we’ll look at the 3 new Principles, but first a few words about how these have come about and how the military uses them. As I said in the first post, we owe the idea of Principles of War (what the first 9 used to be known as) to Baron Anton de Jomini, a Swiss banker turned military officer in Napoleon’s army. Jomini is really the first in Western military history to articulate a set of rules to follow (“Principles”) in the conduct of warfare. Nowadays Clausewitz is more popular and Jomini’s “scientific” approach is criticized as creating merely a “cookbook” for warfare rather than the more intellectual musings of his German counterpart, but in the 1800’s Jomini’s work was the basis for much of the teachings of armies all over the world, including the US Military Academy at West Point; all of the generals on both sides of the US Civil War were brought up studying Jomini. Today, much of what we as the US military study is a blend of Jomini’s “science” and Clausewitz’s “art”. The 9 Principles we’ve studied so far that were previously called the “Principles of War”, while not all concepts articulated by Jomini, directly follow his orderly approach. 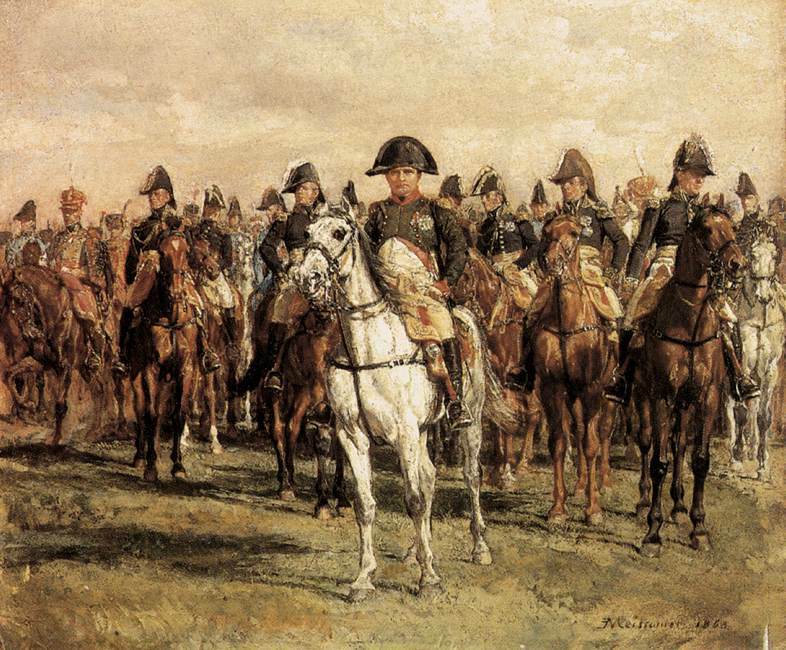 Napoleon and his staff. Jomini is probably in the back somewhere. Jomini formulated his concepts based on his experiences in the Napoleonic wars. While you could find plenty of irregular warfare similar to modern day counterinsurgency (the Peninsular Campaign in particular stands out), it is the experience in large, conventional battles that shaped Jomini’s thoughts. Like Jomini, military thinkers up through the Cold War thought mostly in terms of large-scale, conventional warfare, with two opposing armies fighting battles as instruments of national power. In the post-Cold War world, military thinkers started to pay attention to smaller wars and irregular warfare, developing concepts like MOOTW (Military Operations Other Than War) and LIC (Low-Intensity Conflict). Obviously the old 9 Principles all are still valid, and indeed can be applied to non-lethal means. They can even translate outside of warfare—for instance, those of you bombarded by beer company ads while watching sports are the targets of advertising agencies MASSING their effects on their target audience to maximize revenue; putting commercials for kid’s toys during football games would miss the target audience and violate ECONOMY OF FORCE because it’d be a waste of money. And so we get beer commercials during football and My Little Pony during cartoons. However, it is the US/NATO experience in Iraq and Afghanistan, and mostly the failures of methods designed for conventional warfare to lead to success in a counterinsurgency (COIN) environment, that highlighted the need to rethink how we did things. Simply rolling in and blowing everything up is not an effective way to get a populace on your side, and if you’re trying to defeat an insurgency rather than conquer a country, you have to have the populace (and the international community, not to mention your own citizens) on your side. Hence, we now have added three new Principles to the original nine. We’ll start with the Principle of Restraint. (1) The purpose of restraint is to limit collateral damage and prevent the unnecessary use of force. (2) A single act could cause significant military and political consequences; therefore, judicious use of force is necessary. Restraint requires the careful and disciplined balancing of the need for security, the conduct of military operations, and the national strategic end state. For example, the exposure of intelligence gathering activities, such as interrogation of detainees and prisoners of war, could have significant political and military repercussions and should be conducted with sound judgment. Excessive force antagonizes those parties involved, thereby damaging the legitimacy of the organization that uses it while potentially enhancing the legitimacy of the opposing party. (3) Commanders at all levels must ensure their personnel are properly trained─including knowing and understanding ROE (Rules of engagement)─and are quickly informed of any changes. Failure to understand and comply with established ROE can result in fratricide, mission failure, and/or national embarrassment. Restraint is best achieved when ROE issued at the beginning of an operation address most anticipated situations that may arise. Since the domestic law of some nations may be more restrictive concerning the use of force than permitted under coalition or allied force ROE, commanders must be aware of national restrictions imposed on force participants. Restraint is most easily described through the example of targeting: you don’t take out an entire city block with a JDAAMS bomb to get one guy, because the collateral damage (innocent bystanders killed, property damage, etc.) is more detrimental to your cause than anything one person could do to you. Sure, you’ve eliminated one terrorist, but you’ve probably just created 30 more, as every relative of someone killed and every person who just lost their home is now angry with you and at least going to side with the enemy over supporting you. I can see the wheels turning in some of your heads—how, exactly, is Nate going to connect this to the samurai? After all, samurai weren’t exactly out to win the hearts and minds of the populace. Samurai warfare was a bloody force on force conflict, and we all are familiar with the stereotype of samurai committing suicide rather than being captured or surrendering. It doesn’t appear there was much room for restraint on the Sengoku battlefield. I would agree with this for the most part. However, I think I can illustrate the importance of restraint by comparing Oda Nobunaga to his successor Toyotomi Hideyoshi, specifically how they dealt with daimyo who opposed them. Nobunaga is well known for his lack of restraint in dealing with enemies. While to say he always stamped out his defeated foes is a gross over-generalization, in general he was fairly harsh in dealing with those who opposed him. His treatment of defiant religious groups—primarily the ten year war against the Ishiyama Honganji and the complete destruction of the Enryaku-ji Temple on Mt. 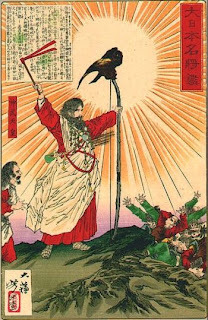 Hiei and the murder of every man, woman, and child on the mountain –stand out as brutal examples of how Nobunaga dealt with any forms of resistance to his authority. The wholesale destruction of the province of Iga is another example. Nobunaga’s brutality made opposing him a choice not taken lightly, for sure. However, the scale of that brutality meant that once a daimyo or other entity made that choice, they had to resist Nobunaga to the death; there was no way to change your mind and surrender, as once you opposed Nobunaga, he was determined to annihilate you. (As I said, this is an oversimplification, as there are examples where this isn’t true, but for the most part it works). Especially after 1575, Nobunaga was powerful enough in central Japan that he could afford not to practice restraint. It possibly bit him, however, when he was assassinated by Akechi Mitsuhide. Since to oppose Nobunaga meant you would face his full wrath with no mercy, the only way to oppose him successfully was to attack him when you could destroy him. This opportunity presented itself to Mitsuhide in June of 1582, when Oda Nobunaga and his small force of body guards were overwhelmed by Mitsuhide’s army at Honno-ji in a surprise attack at dawn. Mitsuhide didn’t exactly have the option of withdrawing from Nobunaga’s service and going somewhere else. Now, let’s look at Toyotomi Hideyoshi. Hideyoshi, of course, crushed Mitsuhide at Yamazaki and was able to claim certain rights as Nobunaga’s avenger, but he lacked the inherent power that Oda Nobunaga had. He could not simply crush everyone who stood in his way. Yet within 2 years of Nobunaga’s death, Hideyoshi had not only consolidated control over Nobunaga’s territory but was expanding it at a much faster rate than Nobunaga ever did. By 1590, a mere 8 years after Nobunaga’s death, Hideyoshi had complete control of all of Japan. How? Well, paradoxically, by using restraint. Unlike Nobunaga, Hideyoshi always gave his opposition a way out of conflict. Beginning with the Mori right after Nobunaga’s death, Hideyoshi would follow a pattern of reconciliation and integration. Those that chose not to submit (Shibata Katsuie, for example, in 1583, or the Hojo in 1590) would be obliterated, but any daimyo that confronted Hideyoshi was given the option to surrender and retain at least a little of what they held rather than face complete destruction. Tokugawa Ieyasu in 1584, the Chosokabe on Shikoku, then the Shimazu on Kyushu, all initially opposed Hideyoshi, only to be defeated (Tokugawa Ieyasu actually won against Hideyoshi at Nagakute/Komaki, but submitted when he saw that no matter how many battles he won, Hideyoshi had material and manpower superiority and would eventually overwhelm him). Once Hideyoshi demonstrated his superiority and capability to annihilate his enemy, he gave them the option of joining him. Some daimyo had their lands reduced (the Shimazu were pushed back into southern Kyushu, the Chosokabe had to give up all of Shikoku other than Tosa province) but some actually benefitted (Ieyasu eventually gave up his home provinces of Mikawa and Totomi, but gained the much larger territory around Edo in the Kanto). In either case, the daimyo were given an out that allowed them to keep their heads, some land, and then gain position within Hideyoshi’s political structure. Eventually, even daimyo not directly confronted by Hideyoshi’s armies (like the Date of northern Japan) saw it was best to preemptively submit to his control. By not following a pattern of total destruction like Nobunaga, Hideyoshi was able to build a coalition of daimyo loyal to him and obtain control of all of Japan in only 8 years. This is a textbook example of strategic restraint. (1) The purpose of perseverance is to ensure the commitment necessary to attain the national strategic end state. (2) Perseverance involves preparation for measured, protracted military operations in pursuit of the national strategic end state. Some joint operations may require years to reach the termination criteria. The underlying causes of the crisis may be elusive, making it difficult to achieve decisive resolution. The patient, resolute, and persistent pursuit of national goals and objectives often is essential to success. This will frequently involve diplomatic, economic, and informational measures to supplement military efforts. Perseverance means keeping up the fight until the other guy buckles. The North Vietnamese did not defeat the US tactically, by far taking the worst of the fighting throughout the entire Vietnam War. However, they had more national will to persevere than the American public did, and outlasted the United States despite their significant tactical disadvantages. Enemies before and since—the Japanese in WWII felt they could force the US to surrender because the American public would not accept heavy casualties, as do terrorist and anti-US forces in Iraq and Afghanistan today—have tried the same approach. The difference in those two cases is that Pearl Harbor and 9-11 so inflamed the US public that the will to continue the fight and persevere was there. (The question remains open in Afghanistan 11 years after 9-11, but this illustrates the point.) Perseverance is the main weapon of any insurgency against a superior power, usually because it is significantly outgunned and outmanned. Insurgencies win when they persevere and demonstrate that the governmental power is unable to destroy them and therefore weak or illegitimate; they fail when the stronger power has the will and perseverance to hunt them down. Two examples will demonstrate this in Japanese history. First, Nobunaga successfully defeated what may best be described as a religious insurgency in his ten-year campaign against the Ikko Ikki and the Ishiyama Honganji. The Ikko sectarian movement, which rejected secular daimyo control in favor of fanatical obedience to their religious leaders at the Ishiyama Honganji temple in Osaka, in many ways, threatened the political order itself, not just Nobunaga’s control of it. A surviving Ikko Ikki meant that a challenge to samurai control of the populace existed. Consequently, Nobunaga could not allow it to exist if he intended to consolidate national political control. Over a period of ten years, Nobunaga fought, blockaded, besieged, and rooted out Ikko supporters in various areas of the country. At times he engaged the Imperial Court to broker cease-fires, in order to give him time to reconsolidate and refit his forces in preparation for the next round of fighting (or to go fight other threats elsewhere, but I digress…). Even in these peaceful lulls, the endstate—the destruction of this religious entity outside of samurai political control—was never abandoned. Nobunaga, as the political hegemon, persevered through obstacles to eventually bring the Ishiyama Honganji to the point of surrender in 1582. 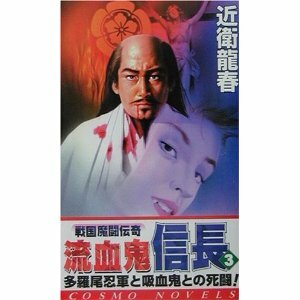 It may seem like this is no big deal—after all, Nobunaga was a dictatorial daimyo who didn’t have to answer to the public, didn’t have reporters documenting things and questioning him like the American military in Vietnam, and didn’t really have to care what other “nations” thought of how he handled the Ikko Ikki. Of course he could persevere, you might say, because he didn’t have anything to keep him from doing so. That would be ignoring the complexity of the campaign against the Ikko Ikki (with campaigns against them fought in three separate geographic regions, the need to dismantle their multi-ringed defenses around the Ishiyama Honganji, and the need to separate them from their supporting allies the Mori and others, on top of fighting other daimyo threats in three different theaters of war). For a counterpoint to that argument, I will show a successful insurgency in Japanese history, outside of the Sengoku period. Kusunoki Masashige, famous as the paragon of loyalty for his dedication to the cause of Emperor Go-Daigo and his struggle against the failing Kamakura bakufu government, is the quintessential insurgent leader. Masashige never struck a crushing blow against Kamakura forces. His success was in surviving. By confounding and eluding government forces in the mountains south of Kyoto, he demonstrated the ineffectiveness of the Kamakura regime for the rest of Japan, especially the leaders of warrior houses, to see. Kamakura’s control rested on the assumption that the Shogun (or rather the Hojo regents who ran the government) maintained military control over the country. Kusunoki’s resistance and defeat of pursuing government forces at Chihaya and Akasaka didn’t militarily or economically cripple the Kamakura regime. What it did, though, was demonstrate that resistance to Kamakura was a possibility. And so, when the first armies sent out to defeat Kusunoki failed, Kamakura sent more armies—armies led by a man named Ashikaga Takauji, and Nitta Yoshisada. Takauji’s army went west, but instead of engaging and defeating Kusunoki, switched allegiance to Go-Daigo and secured the capital region for his return. Nitta Yoshisada’s army turned east back to Kamakura and attacked the government headquarters, destroying the bakufu capital and the Kamakura government once and for all in 1333. Kusunoki’s perseverance and ability to stay alive led to this (temporary) victory. 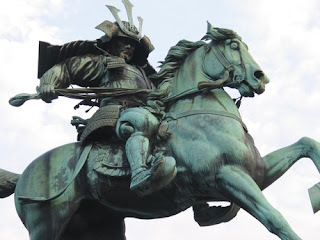 That the successful commanders fell out and eventually fought each other, with Ashikaga Takauji defeating Nitta and Kusunoki in 1336 to take control of Japan, should not diminish from the value of perseverance. In fact, Takauji himself would make a great case study in perseverance—defeated early on, retreated to the ends of Japan (Kyushu), only to gather strength again, return to defeat Kusunoki and Nitta, retake Kyoto and declare himself Shogun, then later forced out by his own brother before returning and defeating him for control of the Shogunate. One last note on perseverance: the old saying describing Japan’s three unifiers states that Nobunaga sewed and picked the wheat, Hideyoshi pounded the flour and baked the bread, and Ieyasu ate it. Tokugawa Ieyasu started as an underling of the Imagawa, became the junior ally of Nobunaga after Nobunaga defeated the Imagawa, challenged Hideyoshi after Nobunaga’s death only to submit to him, and then eventually outlived Hideyoshi and destroyed his son to found his own shogunate which lasted 250+ years. THAT is perseverance. (1) The purpose of legitimacy is to maintain legal and moral authority in the conduct of operations. (2) Legitimacy, which can be a decisive factor in operations, is based on the actual and perceived legality, morality, and rightness of the actions from the various perspectives of interested audiences. These audiences will include our national leadership and domestic population, governments, and civilian populations in the operational area, and nations and organizations around the world. (3) Committed forces must sustain the legitimacy of the operation and of the host government, where applicable. Security actions must be balanced with legitimacy concerns. All actions must be considered in the light of potentially competing strategic and tactical requirements, and must exhibit fairness in dealing with competing factions where appropriate. Legitimacy may depend on adherence to objectives agreed to by the international community, ensuring the action is appropriate to the situation, and fairness in dealing with various factions. Restricting the use of force, restructuring the type of forces employed, and ensuring the disciplined conduct of the forces involved may reinforce legitimacy. (4) Another aspect of this principle is the legitimacy bestowed upon a local government through the perception of the populace that it governs. Humanitarian and civil military operations help develop a sense of legitimacy for the supported government. Because the populace perceives that the government has genuine authority to govern and uses proper agencies for valid purposes, they consider that government as legitimate. During operations in an area where a legitimate government does not exist, extreme caution should be used when dealing with individuals and organizations to avoid inadvertently legitimizing them. Today, legitimacy is about doing what the world—the international community, our own public, and obviously the local nationals in the country we are involved in—will perceive as moral, just, and right. The other two Principles today play into this—if we use too much force and do not show restraint, then that undermines our legitimacy; if we don’t “stay the course” (persevere) and we “cut and run” as soon as things get tough, that undermines our legitimacy in a different way. It would be easy to think that, like with restraint, legitimacy would not matter to a samurai daimyo of the 16th century. After all, CNN was not there to document the war atrocities committed by Hideyoshi’s troops against the Koreans, or Nobunaga’s troops against the Enryakuji, and even if they were, times were different and it’s not as if Nobunaga or Hideyoshi had to worry about public approval ratings. Or did they? I would argue that samurai daimyo, especially those seeking national power, were obsessed with legitimacy. There was a voting public they to which they had to demonstrate competency and right to rule—their warrior subordinates. No, they didn’t go to the polls and cast a vote, but they could certainly vote with their feet (or their swords) and overthrow a weak leader who did not make efforts to seek legitimacy. So, in that regard—what WAS legitimacy, in the 16th century? Consider the fact that, despite the turbulent history and almost constant fighting for control of Japan from the Gempei War in the 1180’s through the Osaka Campaign of 1615, at no time did any samurai leader attempt to militarily supplant the Imperial institution. (Theories exist about Ashikaga Yoshimitsu having the idea around 1400, but there’s no smoking gun that says he actually intended to remove the emperor and assume the title of emperor himself.) Why not? Well, the Emperor was a god—or at least Shinto Nationalism from the pre-WWII era would tell us. How much that was actually believed prior to the Meiji era is up for debate, but the fact remains that the emperor was a symbol of divine rule, whatever his personal status as a deity. This symbolism was hereditary—the emperors descended from Jimmu Tenno, the son of the Sun Goddess—and therefore a samurai warlord could not just waltz into Kyoto and take over the title of emperor, since he didn’t have divine DNA. Force alone wouldn’t do the job. Therefore, political control in Japan, from the time of the Soga and Fujiwara in the Nara and Heian periods through the end of the WWII, rested on the approval and authority (willingly given or not) of the emperor. Recognition by, or control of, the emperor was the difference between being a rebel or being a suppressor of rebels. Gaining court titles, whether or not any material value was included (and after the Heian period usually no land or stipend was attached to titles, but that’s a whole different series of blogposts), gave valuable legitimacy to the holder of the title. This is why samurai warlords fought from the beginning of samurai warfare. The Taira’s legitimacy came in the form of Kiyomori named as regent; the Minamoto restructured things when Yoritomo set up the Shogunate and make Shogun the preferred title for exercising national warrior control. The Ashikaga fought first Kamakura and then Go-Daigo to claim the title of Shogun for themselves, going so far as to set up an alternate successor to the Imperial line as a challenger to Go-Daigo. Some military rulers even leveraged control of the shogun without becoming shogun themselves—the Hojo regents of Kamakura or the Hosokawa Kanrei under the Ashikaga legitimized their control of the government by being “servants and stewards” of the bakufu, under the authority of the weak but legitimately recognized shogun. We see the same patterns in the Sengoku period. Oda Nobunaga, as did most daimyo, developed ties with the Shogun early in his career, even visiting Ashikaga Yoshiteru in Kyoto, according to biographies. When Nobunaga began to look towards achieving national prominence, he found his legitimacy in the goal of restoring Ashikaga Yoshiaki, the brother of the assassinated Yoshiteru, to Kyoto as the heir to the Shogunate. Nobunaga only removed Yoshiaki from power once he had enough power of his own to be legitimate, and according to Lamers, did everything he could to maintain good relations with Yoshiaki. After removing Yoshiaki, Nobunaga established direct ties to the Imperial court, who would reward him with titles further legitimizing his central rule. After Nobunaga’s death, Hideyoshi masterfully used the court to legitimize his military rule. Like we talked about before, Hideyoshi did not really start with an independent power base or a formidable military strength capable of imposing his will on his enemies. The same was true of his relations with the Imperial court. Recognizing the disadvantages of his humble birth, Hideyoshi had himself adopted by a Fujiwara family court noble, instantly giving him a “pedigree”, and adopted the name Toyotomi, associated with the Fujiwara family. This new “lineage” then allowed him to assume titles traditionally assigned to the Fujiwara family—namely, Kampaku (Imperial Regent). While many today assume Shogun to have been a higher title because most military rulers used that title, Kampaku was actually much higher on the prestige scale, especially when also paired with the title of Daijo Daijin (Prime Minister); Hideyoshi held both titles. Of course, titles were not dispensed just because he got himself adopted by the right people. He had to have the military strength and the savvy to demonstrate the power to rule, but the point is no matter how much military power a daimyo had, he still had to rule under the mantle of Imperial sanctioned legitimacy. Well, that concludes our look at each of the Principles of Joint Operations. Next week I’ll return with a look at how they can be used to inform military historical analysis through a case study of a particular battle. You’ll never guess which one that might be…. Department of Defense. Joint Publication 3-0, “Joint Operations” Washington, D.C.: 11 August 2011. Pg. A-3-5 for all definitions. For an academic treatment of Hideyoshi’s “federation” building, see Berry, Mary Elizabeth. Hideyoshi. Cambridge, Massachusetts: Harvard University Press, 1982. Lamers, Jeroen Pieter. Japonius Tyrannus: The Japanese Warlord, Oda Nobunaga Reconsidered. Japonica Neerlandica. Leiden: Hotei Publishing, 2000.